These pictures illustrate how much water is wasted from dripping or running taps. If you have leaks, have them repaired at once. Your water meter measures all water used, even steady drips, and you will be charged for the amount of water you use. A 1 mm stream* wastes 100 litres of water in 24 hours and 3,000 litres in one month. That's 660 gallons and $9.87/month. * approximate width of the tip of a ball point pen. Did you know... The average family of four in Canada consumes 30 cubic m³ (7,925 gallons) of water per month. Use your meter to find out how much you consume. Knowing how to read your meter allows you to monitor your water consumption and detect leaks in your plumbing. Your water meter reads in cubic metres: 1 m³ = 220 gallons. Your consumption is displayed much like the odometer on a car. Every 100 litres of water consumed causes the sweep hand to make one revolution, and causes the measured total to increase by 0.1 cubic metres (the black wheel on the odometer). Ten turns will move the first white wheel one increment. Write down your meter reading at a set time of the day. Write another reading the same time the next day. The difference is your water consumption for that 24 hour period. 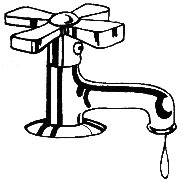 Turn off all water fixtures in your house, including humidifiers, air conditioners, and ice makers. Then watch the low-flow indicator on your water meter. If the red triangle is moving counterclockwise, you have a leak. Do not use the toilet as a wastebasket. Each time you flush, up to seven gallons are used. Place an item such as a plastic bottle filled with sand inside your toilet tank. This displaces water and can save gallons every day. Insulate pipes to get hot water faster, so less water is wasted. Install water saving shower heads or flow restrictions. 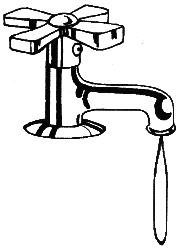 Install faucet aerators, which will reduce water by mixing water and air. Taking baths uses less water then showers. Don't fill the tub more than necessary, and remember to stop the drain before running the water. Do not let the faucet run while shaving or brushing teeth. When hand washing dishes, rather than spraying or running the tap to rinse, use a pan of hot water which can later be used for plants or other cleaning projects. Keep grass 1 1/2" to 2" long to develop deeper roots which will require less watering. Sweep driveways, patios and walks with broom rather than hosing them down. To clean vegetables, use the sink or a bowl of water. Scrub with a vegetable brush and turn on the water for a quick rinse. Use steamers or cover food in a pan with a minimal amount of water. Use a tight lid to conserve moisture. Thaw frozen foods in advance in the fridge to eliminate thawing under warm water. Keep a container of water in the fridge rather than letting water run to get a cold drink. 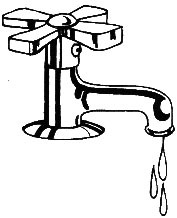 Always check for leaks in pipes, hoses, faucets and couplings. Buckets placed under down spouts can collect rain water for plants or cleaning projects. Use water from dehumidifiers for plants. Use a swimming pool cover to reduce evaporation by 90%. Approximately 1000 gallons of water evaporates from an uncovered pool each month.